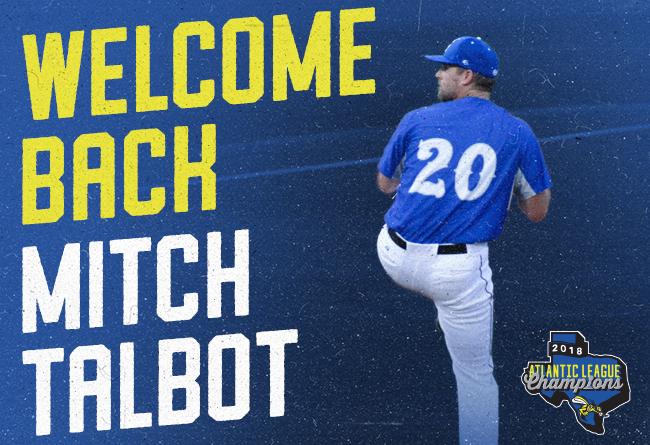 (Sugar Land, Texas, March 6, 2019) - The Sugar Land Skeeters today announced that they’ve re-signed former Major League right-hander Mitch Talbot. Talbot, 35, made five starts for the Skeeters in 2018, going 3-1 with a 1.93 ERA, before having his contract purchased by the Cleveland Indians. Talbot made 18 appearances (17 starts) with Triple-A Columbus last season and went 4-5 with a 2.52 ERA and 1.158 WHIP. The Cedar City, Utah native made his Skeeters debut in 2017 and went 9-3 with a 3.30 ERA in 21 games. His ERA was the second-lowest of Skeeters pitchers with at least 100 innings pitched that season. Talbot made his Major League debut with the Tampa Bay Rays in 2008 and also appeared with the Cleveland Indians from 2010-11. Through three Major League seasons, Talbot is 12-19 with a 5.30 ERA in 43 games (232.2 IP). In 2010, he was second on the Indians with 10 wins, third with 159 ⅓ innings pitched and third with 88 strikeouts. His 10 wins in 2010 also placed him second amongst American League rookies. The Houston Astros drafted Talbot in the 2002 MLB Draft out of Canyon View High School (Cedar City, Utah). Talbot pitched four seasons in the Astros farm system before being traded to the Tampa Bay Rays, with three-time MLB All-Star Ben Zobrist, in July 2006. He was then traded to the Cleveland Indians in December 2009. Along with the Astros, Rays and Indians, Talbot has also pitched at the affiliated level with the Miami Marlins and New York Mets. He’s pitched at the professional level with the Hanwha Eagles and Samsung Lions of the Korea Baseball Organization as well. Talbot first joined the Atlantic League in 2014 with the Long Island Ducks. Talbot is set to enter his 16th season at the professional level. Through 345 career appearances at the professional level, Talbot is 127-101 with a 3.92 ERA and one save in 1,814 ⅓ innings pitched. The Skeeters, winners of the 2018 Atlantic League Championship, open the 2019 season April 25 at Constellation Field against the Southern Maryland Blue Crabs. Season tickets and mini plans for the 2019 season are currently available and individual tickets will soon be made available. To purchase season tickets or mini plans, or for more information on ticketing, please visit sugarlandskeeters.com or call the TDECU Ticket Office at 281-240-4487.